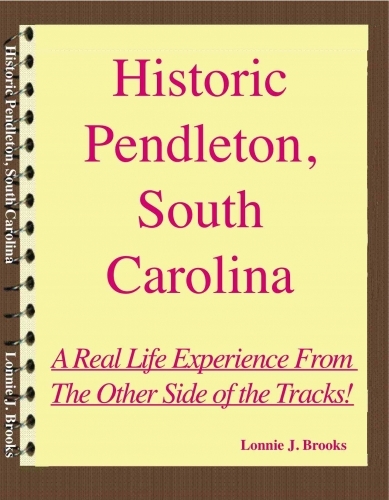 E-Store - Books - Historic Pendleton, South Carolina, A Real Life Experience From The Other Side of the Tracks! Historic Pendleton, South Carolina, A Real Life Experience From The Other Side of the Tracks! The author, Lonnie J. Brooks was born near Bowman, Georgia in 1930 and had to move to South Carolina in 1933 when his Mother was near death from Tuberculosis, to live with his grandparents. Lonnie’s mother passed away on the Pendleton Mill Village in 1933 when Lonnie was only 3 years old. He lived on or near the mill village until he was a teenager and joined the U. S. Navy in 1949. He graduated from Pendleton High School in 1949. Lonnie finished Boot Camp and Sonar School in San Diego, California and met his Sweet Wife to be, Alice Marie Grisham in the same year of 1950. She was 13 and Lonnie was 19 when they first met. They were married two years later in 1952 and were married for 56 years when she passed away in 2009. Their marriage was so wonderful! By the Grace of GOD, they never had an argument, never had a fuss and never had a fight. Lonnie served on a Destroyer, the USS Gurke, DD 783 for over 3 years and served in the Korean War. He was actually in the Inchon Invasion in 13 through 15 September 1950. Lonnie was honorably discharged from the U. S. Navy in 1953. He and his wife relocated to Clemson University in 1953 and he graduated from Clemson University in 1957 with a Bachelor’s degree in Electrical Engineering. Upon graduation in 1957, Lonnie and his Sweet Wife, Alice, relocated to California and have lived in California, Florida and Alabama. They relocated to Huntsville, Alabama in 1980 and Lonnie was employed by Teledyne Brown Engineering for 30+ years until his retirement in January 2010.